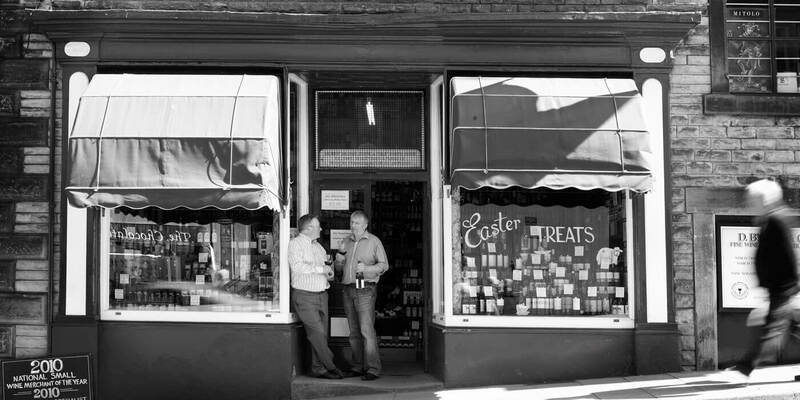 Welcome to D. Byrne & Co.
We are a family owned multi-award winning independent fine wine and spirit merchants which has been trading in the beautiful Ribble Valley in Lancashire for over 130 years. This Victorian shop, with its towering shelves groaning with bottles and warren of underground cellars, is a magnet for wine lovers from all over the country. The current crop of Byrnes, great grandsons of the founder, have been in the wine trade all their lives, you could say it’s in their blood! Between them they can offer a wealth of knowledge and experience second to none and each has their special areas of expertise. Not only do we sell an ever changing range of over 3000 wines we can also offer a staggering range of champagnes, whiskies, specialist spirits and liqueurs and bottled real ales. We even carry a special selection of coffees to make your drinking experience complete. The atmosphere in the shop is worth a visit itself – the creak of the old floorboards, the smell of freshly ground coffee and the tinkle of bottles somewhere deep in the cellars. In order for our business to have thrived for so long it has built a reputation for sourcing and supplying the finest wines and spirits at the keenest razor sharp prices. Traditional yet forward looking, we take pride in the many accolades which have come our way over the years, but our greatest satisfaction is derived from seeing customers return to us for the service they have come to love and expect.